And now, here we are, nine months later with my final blog post of my sophomore year. It’s so hard for me to wrap my mind around the fact that it’s almost summer and that I’m going to be a junior next year. With life being so busy, time is really ticking away, faster than you can imagine. I want to dedicate my last post of the year to my English teacher, Mr. Theriault. Mr. Theriault is not your orthodox English teacher. In his class, I never wrote a full essay, I never took a vocabulary test, and I never did a formal homework assignment. I partook in a Hunger Games-style discussion, and I learned how to ask effective questions. And, you’re probably thinking: Wow, she never did anything academic in her English class this entire year. 2) Craftily forming my words to contradict their response. And the effective questions that I mentioned? Let’s just say, you will not be able to answer one that I ask you, even if it’s about your favorite book. In other conventional English classes, they read books, did worksheets, answered mediocre questions, and gave presentations. Now, that’s great. Doing worksheets is great conceptual practice and giving presentations gives students an opportunity to practice good speech skills. But later in life, in college especially, teachers don’t give worksheets anymore. In life, answering computer generated questions isn’t going to help when your boss gives you a non-rhetorical question that can’t be responded with a 2-worded response. While I was in Mr. Theriault’s class, I didn’t realize how much I had actually learned. (Of course, we always take things for granted until they’re taken away from us) But in reality, I learned so much more in Mr. Theriault’s class than any other English class I had, combined. I learned the expertise to be able to handle myself in college and the real world. I’ve worked way harder on yearlong assignments in this class than any other project I’ve ever done. And besides the English, academic things, Mr. Theriault gives some of the best life advice you can ever get. Raise your hand if you’ve gotten a presentation about where to go on your first date. Raise your hand if you’ve gotten a presentation about how to fix a toilet. Raise your hand if you’ve gotten a presentation that hit so close to home, it nearly brought you to tears. I found myself in Mr. Theriault’s class. I’m not saying that I wasn’t being my true self before his class, but I really found the importance of individualism, of being me. Mr. Theriault’s class gave me an opportunity to do what I love, and be really awesome at it. There’s not a lot of people in this world who really like to bake. And, all my life, I’ve been told to do certain things, to live a certain way. My parents didn’t mold me into a particular human being, but society did. Society made me feel scared when I considered opening my own bakery. I read the news all the time, the economy isn’t right for such a career like that. Science teachers have nailed that studying the medical field is the only way to succeed in life. What if I wanted to be someone else? Someone that wasn’t a carbon copy of what everyone is trying to be these days? It would be great, actually, if I opened my own bakery to sell cupcakes, macarons, French pastries. On the first day of school, the most significant thing I remember was learning to document and share everything. Is a quote that Mr. Theriault takes very seriously. And as I moved on in my journey in high school, I realized that it was the case. People don’t know that you’ve done something extraordinary unless you tell them. We live in a community. Whether its on social media, in a school network, we communicate through sharing. You might not realize this, but without sharing, we would live in a blank world. If people kept their ideas and their accomplishments to themselves, we wouldn’t have Apple, or Sprinkles Cupcakes, or Taylor Swift. Apple exists because Steve Jobs created a revolutionary computer, and he told people about it. And the people who were informed about his new product, sponsored him to make more. The audience I get (you fabulous readers) for this blog is because I share, share, and share. I tag my posts, I share through Twitter and Facebook. Your work is something pure and unique, it is something that should be shared and known. And you know who taught me all of this? Mr. Theriault. I have over 4,000 photos that I took this year saved on my computer. If you don’t have a picture of it, it never happened, right? Mr. Theriault is one of the rare teachers in this world who understands his students. He has this scary 6th sense to know when someone is having a bad day. He speaks genuinely from his heart. I’ve never seen a teacher on this campus who randomly gives students high-fives just for the heck of it. Sometimes, I’ll find Mr. Theriault saying “Keep rocking it,” or “Stay awesome” to his students that he runs into throughout the day. He even comments on people’s outfits sometimes. And you know what happens? The biggest smile appears on their face. In the many occasions that I’ve doubted myself, Mr. Theriault just seemed to know what to say to bring me back to self-confidence. And I’m not saying he’s just a self-esteem motivator. He knows the strengths and weaknesses of each of his students. He brings out and polishes the strengths to shine in his class. Mr. Theriault is selfless. I have his class right after lunch. More than often, he’ll walk in with a sandwich, or tacos, and he’ll give it to someone who didn’t each lunch. Just like that. It’s a simple gesture, but it goes a long way. Food is comfort. One time, Mr. Theriault went to a cupcake truck and bought me a cupcake to try. This Maple Bacon cupcake from Mr. Theriault was TOO GOOD. The fact that he thinks of the little things is really what makes so many students love them. 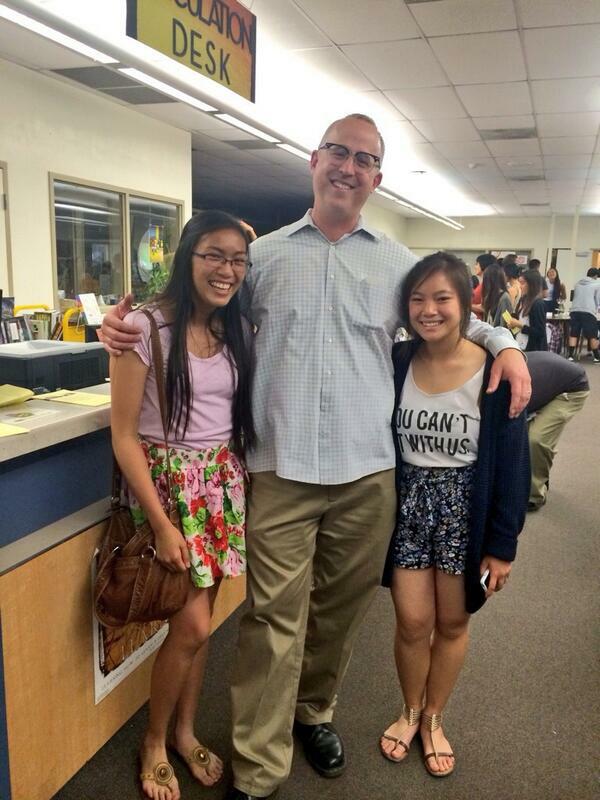 Yes, this is a Mr. Theriault appreciation post. And I’m writing it because I want to thank him for giving me so many opportunities this year to do what I love. He gave me an opportunity to shine. I don’t think there’s ever going to be a class where I can bake and relate it to English for a grade. This blog is one of the most important things to me, it’s my baby. I fashioned it from finger cramps, sweat, and under-eye bags that never seem to go away. My baking business gave me the opportunity to make one of my dreams a reality. And no other teacher has really done that this year. I’m leaving Mr. Theriault’s class not learning about themes in books, but themes in a novel about life that his spirit has written. I’m going to continue this blog over the summer. Hopefully, I’ll update as often as I do during the school year. Thank you to all the readers who followed and read my blog this year.